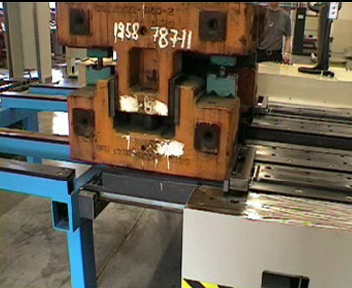 The Die Change Cart WWF series "Side Loader with short Lifting Stroke" pushes the press die sidewards down from its die platform onto the press table. Reverse it pulls the press die down from the press table and sidewards onto its die platform. The sliding mechanism, with which the press die is pushed or pulled, usually is driven by hydraulic cylinders. The sliding mechanism is integrated into the die platform of the Die Change Cart WWF. The Die Change Cart WWF, series "Side Loader with short Lifting Stroke" has a hydraulic lifting device, which lifts the die platform of the Die Change Cart up to the level of the press table, so that the press die can be pushed onto the press table or being pulled from the press table onto the Die Change Cart WWF. The lifting height is aprox 250 – 300 mm. The Die Change Cart WWF, in comparison to a forklift truck, has the advantage that it can drive to the press and can dock there in longitudinal direction. It can pull the press die out of the press onto the die platform of the cart sidewards. Herefore the Die Change Cart WWF, series "Side Loader with short Lifting Stroke", needs free driving space in front of the press, which is a little bit wider than the cart itself with the press die on top, only. Die Change Carts WWF, series "Side loader with short Lifting Stroke", are available up to a load capacity of 60 tons. If you are thinking about changing your die change procedure to die change by die change cart, we should exchange corresponding data. Then we will be prepared to provide you with an interesting offer.